JJC FC-600EXII Flash Diffuser fits well for Canon 600EX II-RT. 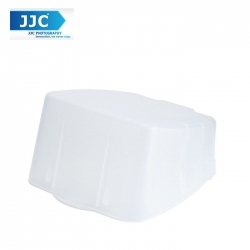 The flash diffuser features high transmittance and abrasion resistance. It is primarily designed to diffuse the light output of the flash, producing softer shadows and a more natural glow rather than the harsher light effect when using a direct flash. In effect, the light will not come from one concentrated source (like a spotlight), but will spread out, bounce from reflective ceilings and walls, thus getting rid of harsh light, and hard shadows. In addition, the unsmooth surface on the interior bottom of the diffuser can further spread the light from the flash. Once the diffuser is attached to the flash head, it will clasp the bounce adapter detector. At this time, the flash senses that and the flash coverage is set automatically. JJC FC-600EXII Flash Diffuser simply slides onto and off the flash with custom fitting, without the need for touch fastener tabs, more convenient and efficient. And the flash diffuser can be used with the color filter from the original package of Canon 600EX II-RT simultaneously. Additionally, this flash diffuser adopts a matte finish on the exterior surface to increase the diffusion effectively to some extent. JJC FC-600EXII replaces Canon SBA-E3.